When listening to "Multi-Colored Ray of Light,"you are guided into seeing and receiving the very Light that you hold within. 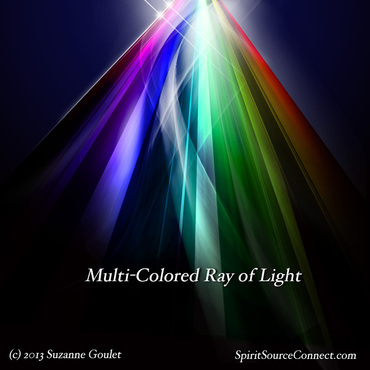 After a time spent discovering the energies within, multi-colored rays are revealed, each engulfing you with its precise, complementary, healing, and transformative energies. Basking in these Rays, you are transported and uplifted to a world of higher solutions, higher Light, and the All-Knowing of the All-That-Is. ​For those of us here participating in the Global Energetic Downloads, that is exactly what is happening! 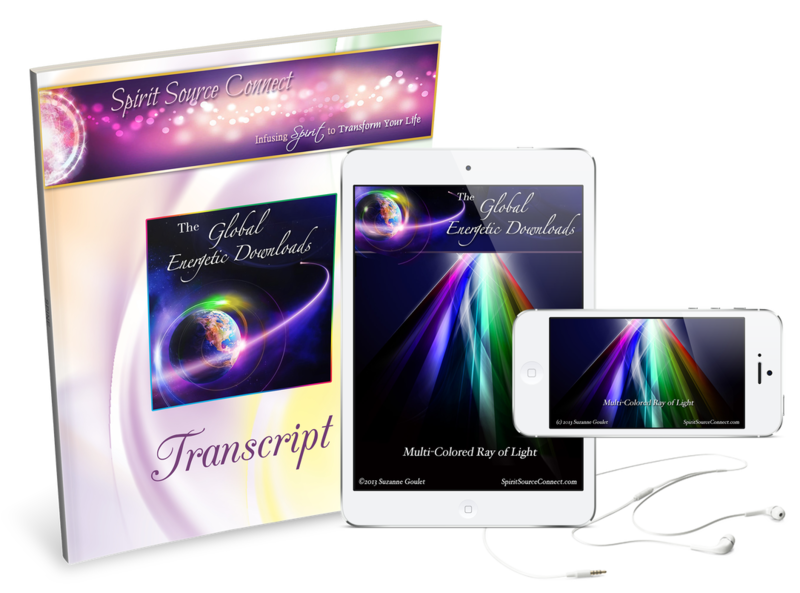 Global Energetic Download was so consistent with delivering high content, beautiful energy, fulfilling words of wisdom, and guiding light. For some of us, we have been listening every day, and the positive shifts and changes that are occurring in our lives individually is so wonderful. Each of these monthly events has been given to you for free—complete with a 24-hour replay. In listening to "Multi-Colored Ray of Light," you are guided into seeing and receiving the very Light that you hold within. 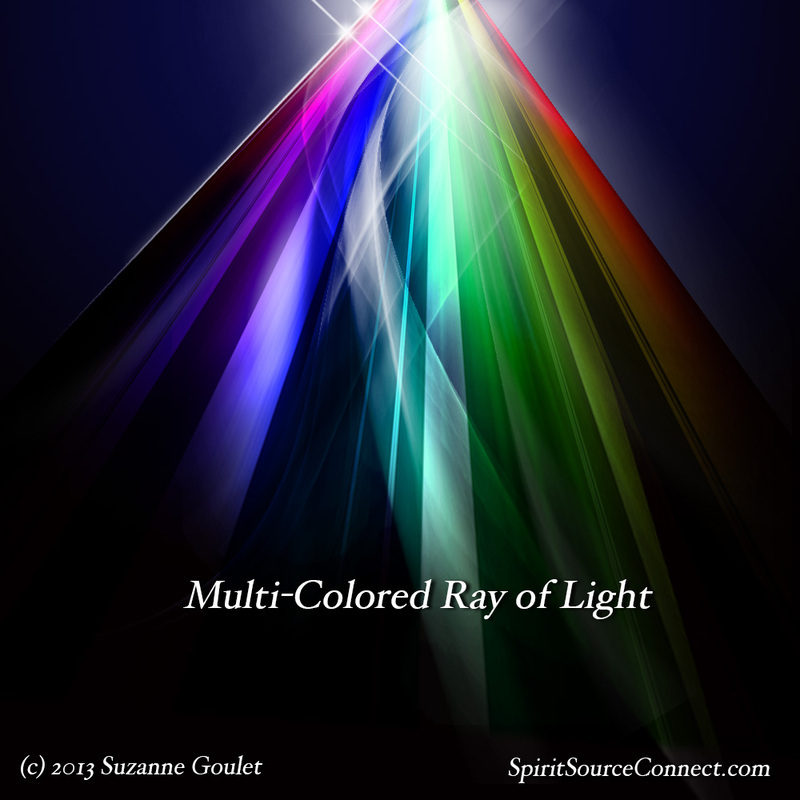 After a time spent discovering the energies within, multi-colored rays are revealed, each engulfing you with its precise, complementary, healing, and transformative energies. "I can’t image the last time I felt such profound love! It was the warmest, most enveloping, deepest feeling of Love ever. So that is why I am hanging out in it. As for the messages, I heard, but I will have to wait for the replay for figure it out and then process it. It was crazy good! " Each rush of colored light washed over us, over and over. There is a deep feeling of being engulfed by a loving, spiritual energy. "I had a profound…feeling of calmness. Of being centered. Being calm, being grounded. Really profound. I saw my light, all the colours in my light. I saw the light expand. "It was really very calming, and I was definitely seeing all the colours. It was interesting…like a bunch of really wide ribbons—one colour after another running through my face, just running right in front of my face. The message about solutions was really powerful. It was really nice, very powerful. I am definitely going to listen to the replay." ​I use this work myself, daily—even twice a day. From my own personal experience, I know that we are being given tremendous doses of uplifting energy. Every evening at sunset, and then again just before bed, is my time. It's not only what I feel during the listening, it's what's happening the following day: surprise income from unexpected places, new friendships forming, but most of all, easy solutions coming to problems that normally would be time consuming to resolve! "Mary Beth: I went really deep, in fact, I’m having trouble coming back out, totally coming back out. I guess the most profound thing happened at the end where I saw guides come and do a clearing—an internal clearing—on me. Clearing out, clearing out—taking it out, taking whatever out—and then another guide came in and put light in. Pink light, gold light …so I feel as if I have had a healing of sorts. And during the meditation I did see the colors, and I just did go really deep. But the most profound experience was there the end. It was like right when you were getting ready to come out, they appeared and, so… that was really wonderful. Suzanne: Thank you, because there was that intention from Spirit, to reach out to 3–4 people who are very ripe for some deep healing. Mary Beth: I felt like they went in very deep, I could see them go in… it was like going in with your hands… and just scooping out and scooping out, scooping out. Just scooping and gathering whatever… was in there to be cleared out. And then one guide had all that had been cleared and then each guide came in after…. And I couldn’t see, sometimes I can see what looks like a person or some features, but this was more like an outline… of an entity, but like a person, but no features. And I saw each one come in and they were very specific, the white light first, the pink light, then the gold light… so…. Suzanne: Yes, those are very feminine colors, and um, there was definitely quite a lot of that healing energy. You know it has a different tone, a different strength, a different density that goes in and gets that really hard-to-get material that is affecting you physically." "I was able to be present for the whole thing. I do a lot of energy work—that helps being a first timer. Primarily I tend to feel, as opposed to see. During the whole process I felt the whole energy moving like a circular tide coming in and out in, and out. It was very soft and gentle, kind of energy motion for me, and at the end with the deep healing it was more centered in the solar plexus area, with a sort of a heavier circular motion, but that is basically [how] I tend to be —I am a feeler, not a visualizer, so I do it on the body level. And so that was my experience." ​By listening to each of these downloads daily, so many positive shifts and occurrences of healing can happen for you too. Each set includes a transcript of the meditation as well. These are Divine spiritual prayers in and of themselves. You will also receive the .mp3 audio files, and a CD mailed to your door. I hope you will choose healing and transformation for yourself and accept these Divine gifts being delivered to us all now.